Beautiful views, direct beach access, and comfortable living can all be yours at Breakers Bliss! 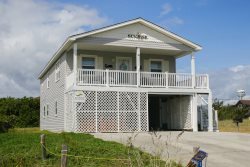 Located in the heart of Kill Devil Hills at milepost 9.5, Breakers Bliss is located in the Breakers oceanfront condominium complex, convenient to many local restaurants, unique shops, and family attractions. After a day of playing in the surf, your family will definitely enjoy relaxing in the community swimming pool. There is plenty of space for everyone to soak in some rays! A dune top deck offers the guests of Breakers Bliss panoramic views of the Atlantic. It's the perfect spot to enjoy your morning cup of java while watching the sunrise. The spacious home is a three-level condominium that features 3 bedrooms and 3 full bathrooms. Tastefully decorated with bright beach decor, Breakers Bliss affords each vacationer enough space to unwind. The first floor has two bedrooms. One is a Queen master suite with a full bathroom and deck, and the second contains two twin beds with a TV and DVD Player. There is also a full bathroom on the first level. On the second level, you will find the kitchen, dining area, living room with sleep sofa and a balcony for relaxing and enjoying the ocean views. The third level contains a second Queen master suite with a full bath and gorgeous ocean views. To enjoy some fun in the sun, just walk down your private stairs to the pool or walk a few more steps to the sandy, lifeguarded beach and sparkling Atlantic Ocean. Top Level - Master Suite with Queen Bed and Full Bathroom.